Like watchin Surviorman? Like Les Stroud? Well maybe you'll like this new line of affordable outdoor knives designed by him and produced by "Camilius". Now last I heard Camilius went out of business. So most likey these knives, which are made in China (and look strikingly similar to some Gerber products we know and love) are the products of some company that bought the name of the beloved American cutlery firm. That being said, this lineup consists of four knives total, two medium fixed blades, a folder, and a heavy machete. 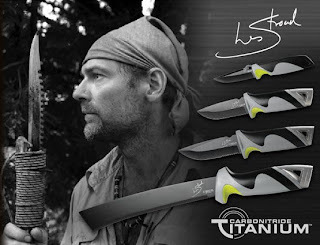 The Les Stroud Survival Knives don't look too bad for the price averaging $45 to $50 per knife. The blades are made of a 440 series steel, probably 440 a, so they should be very stain resistant (especially since they all feature some form of titanium nitride coating) decently resilent, and easy to sharpen.The handles should be reasonable as well, being made from FRN with rubber overlays, the fixed blades' handles also feature a steel pommel. The sheaths are apparently a ballistic nylon with multiple functions. Each knife comes with a fire rod too. These knives are fine for the average user. All in all, these knives seem like a good choice if you don't have stacks of money to burn, you like a good sturdy knife, machete or folder, and you like to play outdoors in a wet enviorment, the beach, swamp, swimming pools, etc. I just bought the ultimate survival knife from this knife line and I have to say that I am pretty happy with it. for 50 bucks this is a pretty decent knife on par with say a Gerber prodigy, Bear Grylls knife etc.